6 months & up. 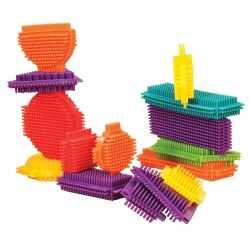 Encourage imagination and eliminate frustration with this 24 piece building block set that is easy for even the youngest builders to attach and stack together. No need to align the blocks perfectly. Interlocking pattern makes it easy to attach and pull apart. Stack up or even build sideways. 9 months & up. Stack soft foam blocks to create simple shapes and add chunky accessories to make the city come to life. Includes wood-like and color blocks, people, cars, stop light, trees and bushes. Wood-like blocks measure 1 3/8" thick. 29 piece set. 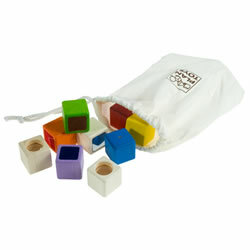 Soft Shape Blocks - Set of 12, 2" x 2"
6 months & up. Introduce shapes to infants and toddlers with Soft Shape Blocks! 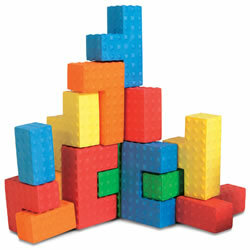 The set of 12 blocks features a variety of shapes and colors. 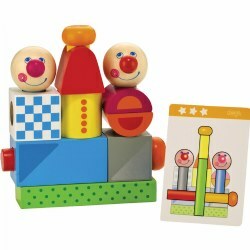 Children can begin basic shape recognition (circle, square, triangle) while they practice stacking and building. Great for sorting and matching by shape and color too! Surface wash only. Colors may vary. 18 months & up. 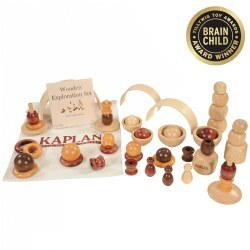 This high-quality 50-piece wooden set encourages open-ended exploration and learning through children's developing senses. Young children instinctively investigate objects that interest them and make discoveries through taste, touch, smell, sound, and sight. This set inspires a world of discovery! Includes storage bag. 18 months & up. Soft, flexible and oversized for small hands, this 36-piece Brix set comes in nine shapes and easily attaches from almost every side. Includes storage box for easy clean-up. 12 months & up. Discover the different textures, sound and color to stimulate touch, feel and various sounds. 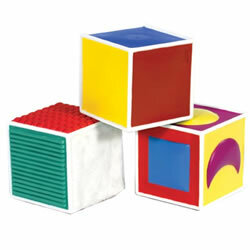 This activity block set consists of 3 visual blocks, 3 auditory blocks and 3 texture blocks. Includes storage bag. 18 months & up. 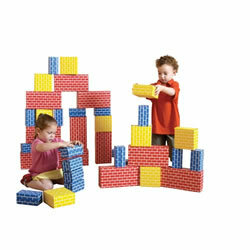 These sturdy, double octagon blocks are easy to stack and the jumbo size makes them ideal for the beginning builder. The plastic blocks are great for inside or outside. 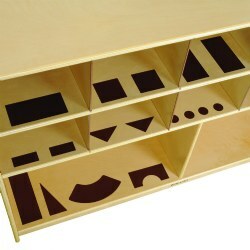 Includes 6 colors, 6 of each and measure 5 1/2"L x 2 1/2"W x 2 1/4"H.
Utilizing block shelf labels to organize the block area allows children to clearly and confidently interact with all the block area has to offer. It also helps children develop organizational skills as they put away blocks and match them to the correct label. The simple and specific block shelf labels complement all block sets, are visually appealing, and invite children into the space. Includes 85 dark brown, adhesive, precut labels. Surface clean labels with warm water and mild soap. 2 years & up. 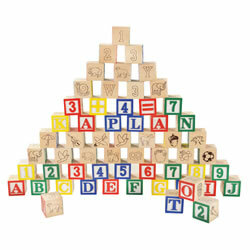 Develop coordination and motor skills with these cardboard blocks. 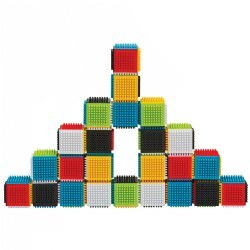 44-piece set: 28 small bricks (6" x 3" x 3"), 8 medium bricks (6" x 6" x 3"), and 8 large bricks (12" x 6" x 3"). All in red, blue, and yellow. Truck not included. 10 months & up. Little ones will be eager to get their hands on these Click N Links! Children can snap the pieces together, pop apart, and sort by color or shape. 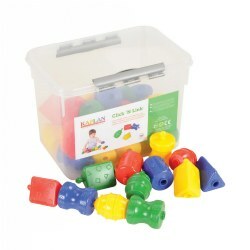 This set of manipulatives promote hand-eye coordination and fine motor skill development. Pieces measures 3 1/2" long. Included: 36 Click N Link pieces in a storage tub. 6 months & up. Grasp, stack, squeeze and squeak! 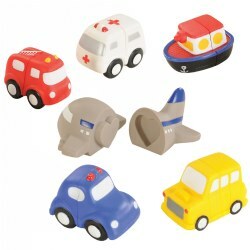 Soft, phthalate-free vinyl blocks feature a brightly colored image and six raised images for baby to explore. Surface wash.
12 months & up. 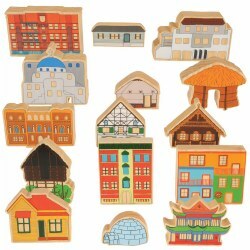 From huts to high rises, this wooden set of family dwellings includes a variety of homes from all over the world. Tallest building measures 5" high. Set of 15. 6 months & up. 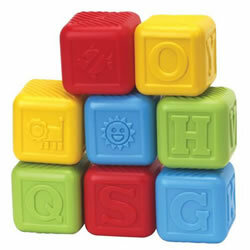 Colorful, educational blocks include the complete alphabet and stimulate creativity and coordination. This 8 piece set is made of plastic and have rounded, textured sides. Blocks measure 2 1/4" x 2 1/4" each. Colors may vary. 2 years & up. 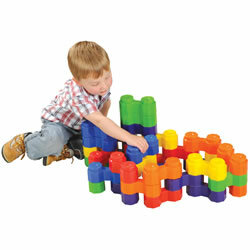 Bright colored oversized foam blocks in various shapes fit together like a puzzle for endless construction possibilities. 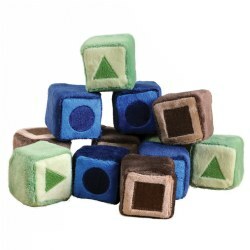 The side are covered with raised pyramid shapes for easy grasping and sensory stimulation. 1 1/2" thickset of 18 blocks. 2 years & up. Bring light and color to block play with this set of 40 smooth hardwood blocks inset with colorful, transparent acrylic windows. 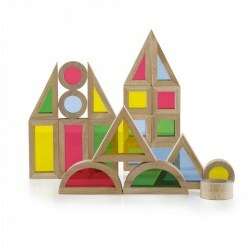 Sized right for little hands, these blocks feature 6 different shapes, 4 different colors and are ideal for color exploration, early construction and shape recognition. 3 months & up. 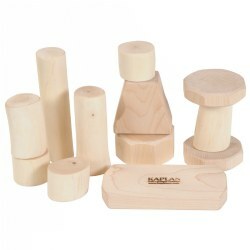 Increase eye-hand coordination and tactile skills with our new blocks. Each one is 4" square with each side having a different texture, color, shape, and feel. Washable. Colors may vary. 2 years & up. Sized right for little hands. 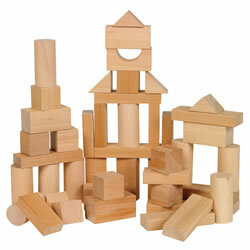 50 assorted natural blocks in six different shapes and sizes. Largest block measures 3 3/4"L x 1 1/8"W x 3/4"D.
6 months & up. Soft and squeezable, these fun shapes with their knobby surface will stimulate the senses as toddlers squeeze the pliable material in their hands. Shapes include a heart, flower, hexagon, diamond, clover, and star. Birth & up. Allow children to explore nature from the comfort and safety of the classroom with this set of wooden blocks. Includes an eco-friendly cotton storage bag. Set of 12. 2 years & up. Stack, build, count and spell with these 100 colorful blocks. Each featuring a variety of pictures, letters and numbers. Storage box. Birth & up. 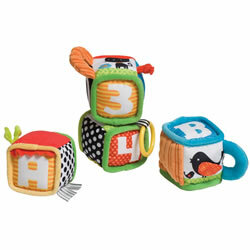 Four easy-to-grasp soft blocks with activities for baby to explore. Baby will love discovering silly sounds, interesting textures, bright colors and animal friends. Encourages development of fine and gross motor skills. Surface wash. Birth & up. 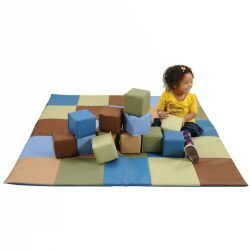 Combine this soft, vinyl play mat with coordinating soft blocks for a variety of play experiences -- building, color matching, patterning, or just a cozy resting spot. Mat measures 57" square by 1" thick. Blocks are 5 1/2" cubes. Available individually or sold together as a set.